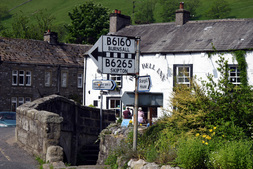 Kettlewell - as seen in 'Calendar Girls'! Wharfedale runs from the north at Cray down to the south of the Yorkshire Dales National Park boundary and Skipton. It encompasses limestone hills, moorland, waterfalls, rivers, and ancient woodland at the Strid, on the Bolton Abbey Estate. Steep hills and rocky crags make Wharfedale popular with walkers so it’s no surprise it’s known for the fell races at the Kilnsey Show and Burnsall Feast. This area is rich in wildlife and local folklore, such as the legend of the ghostly black dog of Troller’s Ghyll and the sad demise of the Boy of Egremont. From the stony outcrop of Simon’s Seat it is possible to see much of the southern dales stretching before you. You can look down the Valley of Desolation (now full of life), to the pretty village at Appletreewick (pronounced “Aptrick”! ), and along the river towards the beautiful ruins of Bolton Priory. Wharfedale has many attractive and characterful villages such as Burnsall and Buckden where its five-arched bridge spans the Wharfe and is a popular paddling spot. You may recognise Kettlewell from the 'Calendar Girls' film. It’s also where models of another kind can be found in August when its much-loved scarecrow festival takes place. At nearby Kilnsey Park you can see red squirrels, fish for your supper or simply marvel at the height of the crags and the climbers trying to scale them. Grassington is a lively centre with plenty of atmosphere, particularly in December during its Dickensian festivities. It has an excellent summer arts festival and many small shops, including one that sells an amazing range of Yorkshire beers!